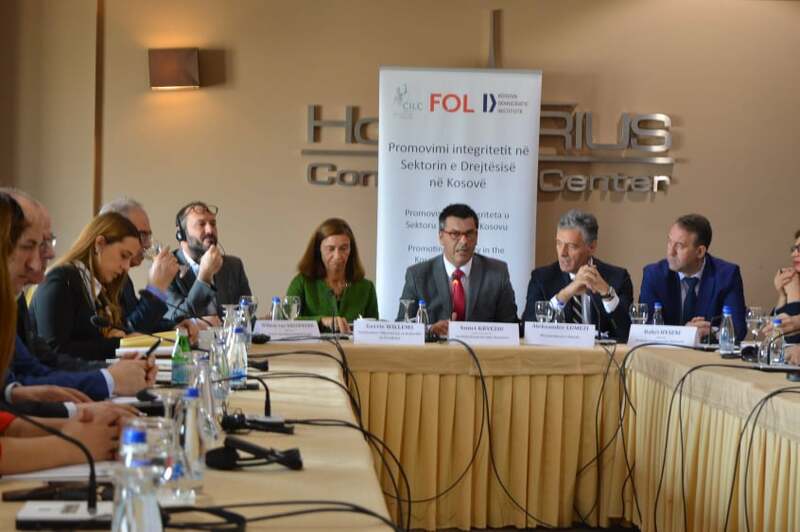 In the closing conference of the project “Promoting Integrity in Kosovo Justice System”, supported by the Embassy of the Netherlands in Kosovo, the project team presented the information on the activities and achievements. Mr. Aleksander Lumezi, Chief State Prosecutor expressed his satisfaction that the project which was conceived after extensive consultations with the Embassy of the Netherlands resulted in great success. “We have the new code of ethics for prosecutors, the commentary that derives from the code and modules for a series of trainings developed by the team of Dutch trainers. We are committed to continuing our cooperation with our trust-worthy partners in order to advance our effectiveness, efficiency as well as transparency and accountability”. Mr.Willem van Nieuwkerk, Director of CILC (Center for International Legal Cooperation) highlighted the importance of integrity in our personal lives and when performing in our career path. “Integrity deserves constant attention” he stated, continuing that “in our daily work, we face many moral dilemmas and the code of ethics provides exactly that framework when you feel the need to solve those dilemmas. With this project, we have brought the experience of the Netherlands Prosecution Service and working with Kosovan colleagues we drafted the new Code of Ethics and the corresponding commentary with concrete illustrative examples from the daily work of prosecutors. We hope that Kosovo State Prosecutor will effectively use the code of ethics and value it as a safe haven – a code to rely on” – concluded his presentation Mr. Van Nieuwkerk. Mr. Bahri Hyseni, the newly-elected KPC chairperson, re-iterated Mr. Lumezi’s vow that the State Prosecution in Kosovo will keep its doors open for all the partners that show good will in helping us improve our performance. “KPC is working on the new strategic plan where the capacity building component through various training programs for prosecutors and their professional associates constitutes the lion share”, ended his presentation Mr. Hyseni. This two-year project that provided technical support and expertise to the justice system was implemented jointly by CILC, KDI and FOL. Today’s event marked the official closure of the project after the completion of activities ranging from a full scale integrity scan of the justice system to the new code of ethics, a commentary of the code and a series of trainings on ethics, media and public relations.